This was the first huge climb with the backpack carried by us and not the horses. More people were on the Trail now because this is where the official 4-days Inca Trail starts. Around the Plaza de Armas in Cusco many travel agencies offer trips to the Inca Trail. Some sell the trail as 3 days and 2 nights, which is cheaper than 4 days and 3 nights. Some budget travelers choose this cheaper option. Keep in mind that the Trail has to be done a lot faster which is very exhausting. 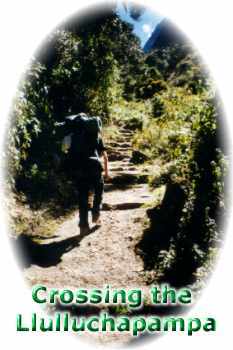 Many travelers complain afterwards, wishing they paid a bit more for the 4 days Inca Trail. Although it is astronomical winter in June, this part of the year is the dry season and the sun stood high in the sky and spread its merciless rays over this subtropical World. We lost sweat by the litter but had to continue. We arrived in a wonderland of tropical vegetation, waterfalls, orchids, vines, moss and a silence only disturbed by birds like the humming bird, parrots and many others. No words can be found to describe this beauty and every five steps Mathew and me had to stop and enjoy this land of miracles. 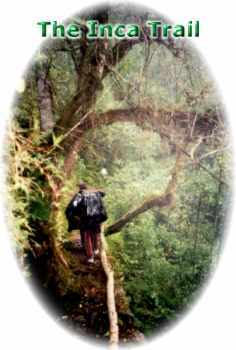 Yes, we were in the Inca World, rough scenery relieved by the beauty of nature and the luxury of the well preserved Inca Trail. Many hours we stayed there, wordless, listening and contemplating. In the sound of rolling rivers and waterfalls we could here Indians singing and dancing. Was this a hallucination or part of the mystery? Their language was incomprehensible and penetrated straight to the soul. We had to continue and finally got above the rain forest and arrived on a plateau where lamas, donkeys and horses were grazing. We left the Trail and walked through the enormous valley and finally arrived at our next camping place. Zenon prepared a nutricious dish. We had an animating chat and finally fell in a deep sleep. Continue to Warmihuanuska or the "Death Woman's Pass"